From our vantage point in our luxury suite on board the M/V St. Therese of the Child Jesus, my wife had seen the drama unfolding before her very eyes. The time was approximately 6:00 Tuesday evening, July 19, 2016. We were in the waters off Roxas City-Mindoro and Romblon. My spouse had been relaxing inside our spacious cabin room when she saw two Filipinas outside screaming. I took the following photo shortly before the tragedy occurred. My asawa had a pensive look on her face as if she had a premonition as to what would soon occur. The two ladies my wife saw outside that window were trying to prevent the unidentified man from jumping off the ship but to no avail. The life preserver was thrown out as passengers flocked to the scene straining to catch a glimpse of the passenger who had jumped. Security officers on the ship soon cleared the area and our vessel stood still in the water. I have no idea how long the ship remained at a standstill. 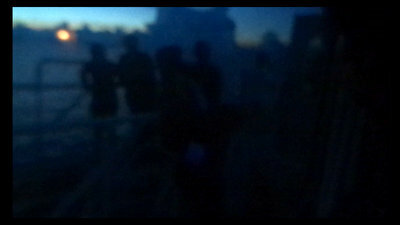 Our vessel was scheduled to arrive in Iloilo around 5 am but we did not reach our destination until 7 am, two hours later. According to the Daily Guardian Iloilo, Lt. Cdr. Ramil Palabrica, Philippine Coast Guard, PCG-Iloilo station commander said PCG-Batangas conducted search and rescue operations Wednesday, the 20th. Palabrica said the passenger might have been bound for Bacolod as all Iloilo passengers were accounted for once the ship docked in Iloilo. The man was said to be about 40-45 years old, and was wearing jeans and a blue shirt. A Friday, July 22nd article from the Negros Daily Bulletin stated a woman had reported her husband missing. Her spouse was a passenger on the 2Go vessel. Two days after the St. Therese of the Child Jesus arrived in Bacolod City, the ship’s final destination, her spouse, Enrico Pamplona 47, had not arrived home. Emma Pamplona, 46, of Sitio Patyo, Barangay 1, Manapla was constantly calling her husband and asking about the weather conditions and the vessel’s location. She called him from 3:00 p.m. to 5:00 p.m. Tuesday. At 5:00 pm Enrico excused himself to go to the comfort room. He left his cellphone on his bed. She tried calling later but no one answered the phone. She called again and someone picked up the phone. But it wasn’t Enrico. It was the victim’s bunk mate. Most vessels have economy accommodations that offer passengers a section with dozens of bunk beds with a common comfort room for everyone to share. Unfortunately it would seem that the missing husband, Enrico Pamplona, was indeed the man who jumped overboard. Our most sincere prayers go out to the man’s wife and family. So sad. My thoughts go to the man and his family. It must have been tough to be a witness to this. He chose a permanent solution to what might have been a temporary problem. Impossible to know what goes thru ones mind at a time like this. I hope he is at peace now. Thanks, Mike. We held out hope that the man was found because of an announcement which came over the PA system. “All medical personnel report to the clinic!” Sadly, we discovered later that the man’s body was never recovered. Can’t imagine what his poor wife is going through. My heart goes out to Mr. Pamplona’s family. Hopefully this was not witnessed by young children. I guess he thought it was the only way out. Well, Papa Duck, thankfully we didn’t see any young children that witnessed the event. The two ladies that originally saw the man jumping tried their best to stop him, but to no avail. Yes, unfortunately, the poor soul must have thought this was his last option. Very sad to hear that! Curious to wander what was so wrong that made him to that. Very hard for his wife and family to ever get over such a thing. I doubt that the family will ever get over this tragedy, Bill S. In one news report the wife was puzzled as to why her husband took his life. Our prayers certainly go out to her and the family. Dave, Off topic but I was just wondering what you thought about the safety features of the ship? I am a true land lubber but that one looks big enough to consider taking the better half for a cruise down the coast. Thanks for any info. Tony, I can’t swim. I can’t even float. There were life jackets readily accessible in our suite. Despite the terrible incident, I wouldn’t hesitate to go on this ship again. This was a modern, well-maintained vessel and the entire crew were very professional and first-class. 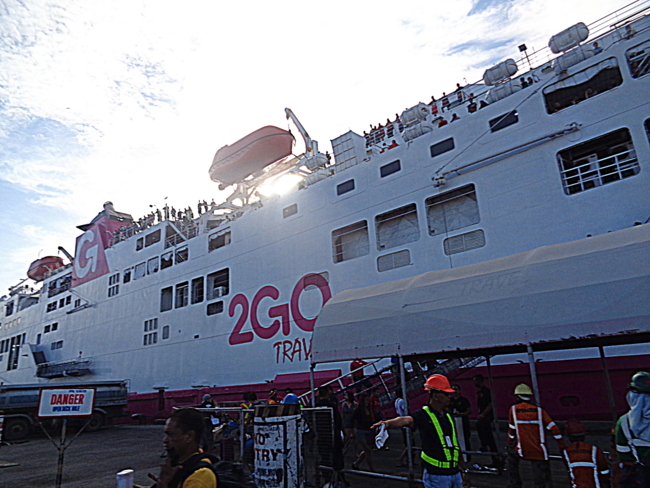 2Go’s featured destinations are Manila, Caticlan (the gateway to Boracay), Bacolod, Iloilo, Cebu, CDO, Zamboanga and more. Check out their website for more info if you get time. Take care. Thanks Dave, I had seen their site before, just wanted some first hand input. You’re welcome, Tony. I wholeheartedly recommend booking with 2Go.